Are you in the process of or thinking about hiring more nursing staff? Whether it’s an ICU nurse, ER nurse, OR nurse, or home nurse, there are several interview questions that you need to ask to find the best and most qualified nurses. Below you’ll find a complete list of general nurse interview questions that you should use during the job interview process. Why do you want to work for this hospital / organization? What drew you to the nursing profession? Tell me about a time you inadvertently caused conflict? What can you bring to our team? What are your weaknesses? What is your area of greatest potential? If I called your previous supervisor, what would they tell me about you? How would you define a leader? What questions would like to ask me/us? Why did you choose the particular field of nursing that you are in? What are the biggest challenges or issues that nurses face today? Why do you feel you are qualified for the job? As a healthcare employer, you may want to leverage behavioral interview questions when hiring nursing staff. Behavioral based interview questions will give you a sense of how a nurse will perform or behave in specific circumstances. Describe a situation when you had to work closely with a difficult or confrontational coworker. How did you handle that situation? Were you able to work together and collaborate with this person? Talk about a conflict within your nursing/ healthcare team. What was the conflict and how did you handle it? Describe a time when you were particularly proud of your nursing/healthcare team? What was your role in this situation? Tell me about a time where you stepped into a leadership role. Do you find yourself stepping into these roles frequently? Tell me about a time when a patient’s family was dissatisfied with your care. How did you handle that situation? Were you able to remedy the conflict or come to an understanding with them? What approach do you take in communicating with people who do not know medical jargon? Give an example of a time you explained medical terminology to someone who was unfamiliar with any medical terms. Describe a time you provided effective patient and/or family education. Describe a time a patient or their family was appreciative of your care and treatments. Give an example of a time you had to interact with a hostile patient. How did you handle the situation? What was the outcome? Describe a time you were faced with a patient who chose not to communicate or disclose important information. Tell me about a time you were under a lot of pressure. What was going on, and how did you get through it? Tell me about a time when you didn’t know the answer to something at work? How did you go about finding the information? Give me an example of an awkward situation at work. How did you remove yourself from the situation? Tell me about a time you failed. How did you deal with that situation? Describe a time when you anticipated potential problems with a patient and initiated preventative measures. Talk about a time you worked in a fast-paced setting. How do you prioritize tasks while maintaining excellent patient care? Describe your experience with a very ill patient who required a lot of your time. How did you manage this patient’s care while ensuring your other patients were adequately cared for? Talk about a time when you felt overwhelmed with your work or patient load. What did you do? Give an example of an important goal you set for yourself. Did you accomplish that goal? How did you ensure that you accomplished it? Give an example of a time when you were able to successfully persuade a patient to agree to something. How did your persuade them? Describe a time when you were the resident medical expert. What did you do to make sure everyone was able to understand you? Tell me about a time when you had to rely on written communication to explain yourself to your team or to a patient. Talk about a time when you had not communicated well. How did you correct the situation? Describe a time when you received negative feedback and turned it into something positive. What is one professional accomplishment that you are most proud of and why? Talk about a challenging situation or problem where you took the lead to correct it instead of waiting for someone else to do it. Have you ever felt dissatisfied with your work as a nurse? What could have been done to make it better? Describe a time when you went over and above your job requirements. What motivated you to put forth the extra effort? Give an example of a mistake you’ve made? How did you handle it? What do you find most difficult about being a nurse? How do you overcome this difficulty? During a phone interview, you’ll want to gather as much general information about your nurse candidate as possible. Here’s a good opportunity to ask phone interview questions related to their motivations, and general experience. You’ll want to save more detailed questions for later in the interview process. Note: You’ll see some overlap with the general and common interview questions here. Why are you leaving your current nursing position? What interests you about working at [insert your company name]? Do you prefer working alone or as part of a nursing team? How would you describe your organizational skills? Explain. What do you feel you bring / contribute to your patients’ experience and care? How do you handle a patient who complains? How do you handle stress on the unit? Have you ever had any differences with the nurses you’ve worked with? What would you do if your replacement did not arrive? With so many interview questions to choose from, you’ll want to narrow down the above options into a top 25 list. Choosing 25 questions for your nurse interview will help you adhere to your allotted interview time, as well as provide a structure for the entire interview. Below you’ll find an example of 25 interview questions that could be used for an in-person interview. What do you find rewarding about being a nurse? Tell me what you feel is your greatest skill as a nurse. How do you handle the stress of the job? What do you find is the hardest part about being a nurse? Why are you the best nursing candidate for this position? What do you find most appealing about working for our facility/organization? Describe a time you had to deal with a difficult patient and how you handled that. How do you handle a patient’s/family's questions that are outside of your expertise? ? How do you deal with a patient who isn't following care instructions? Family members want to make sure their loved one is getting the best quality care. How do you reassure them? How do you deal with a patient or family member of the patient who wants to blame you? What do you do when a patient or family member of the patient usurps time you need to allocate to other patients? Tell me about a time you spotted upcoming problems with a patient. Tell me about a time you had to persuade a patient about something. Sharet a time when you felt overwhelmed with your work or patient load. What did you do? Talk about a time a patient or their family was particularly pleased and appreciative of your care. Give an example of a time you had to interact with a hostile patient. How did you handle the situation and what was the outcome? Talk about a time when you did not communicate well. How did you correct the situation? After narrowing down your candidate pool to the short list of nurses you’d like interview further, we recommend checking references before you invest any more time in the hiring process. Valuable reference feedback can help you narrow down your list of quality candidates, and weed out the bad candidates before they waste any more of your organization’s valuable time. One step to gathering detailed, candid and actionable feedback from references is through using relevant, consistent reference questions. The best reference questions to ask are the questions that lead to the highest quality hire. Checkster’s digital platform provides templates of reference questions that are validated by independent I/O psychologists and found to be accurate and reliable predictors of performance and turnover. Keep in mind, that inconsistencies in reference questions can lead to inconsistent feedback. Checkster can be used to customize and then standardize questions across all reference checks, even across the company. It’s an easy way to ensure you remain compliant and legal with all questions asked by administering a set of digital questionnaires. In addition, do you get answers to all your questions when you ask them via phone? How candid is the reference feedback? Too often, references are careful in their responses over the phone, and do not open up, therefore supplying short, trivial answers. Consider using an automated reference checking tool like Checkster to gather highly detailed, honest feedback about candidates. 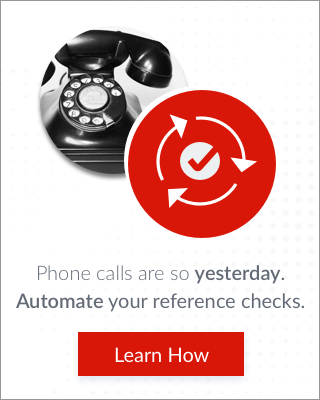 Compared to the 2 responses on average you’ll get from the phone (after over an hour or more of a recruiter or manager chasing them down, Checkster sees an average of 6 responses returned within 48 hours (with only 2 minutes of time invested by the recruiter) without anyone having to spend time on the phone hunting down references. By gathering reference data digitally with Checkster, you will be able to administer dependable, quality questions, save yourself precious time and stress, while receiving candid, consolidated feedback that consistently leads to smarter hiring decisions.